Mister excels for its elegant design and attention to details, as the herringbone pattern of the door. 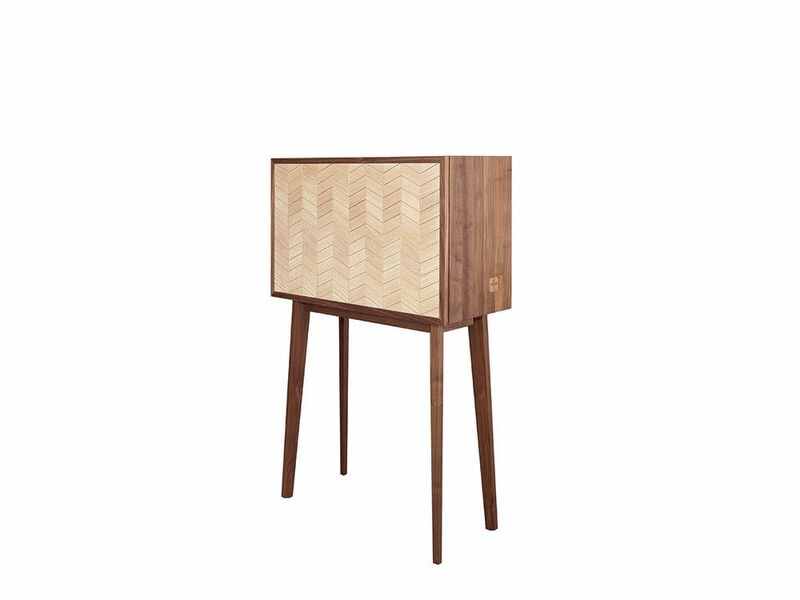 Structure and door in solid walnut, herringbone pattern in the door in solid oak. Designed for people and environments in constant change, mister stands out for its versatility and customization. The interior can be completely rearranged according to different needs, allowing it to be used as a bar, a desk or simply as a sideboard. "Daniel Duarte is graduated in interior design and equipment by school of applied arts of Castelo Branco in 2009. In that same year he moved to madrid to join the multidisciplinary team Kawamura Ganjavian, where he developed several products and projects. Back in portugal he started in the company wallshape and was one of the selected designers for integrate an eight months residency in the programe more design more industry in Paredes. Recently in valencia he collaborated with the company Futhark, where it was designed 80% of the Bo Concept collection. Currently he conciliates his work with multiple projects collaborations."